We teamed up with Laurie March from DIYNetwork.com to bring you the best holiday entertaining tips, plus a pantry makeover by Laurie! Some people like to organize their pantries alphabetically, some according to size…and some people don’t like to organize at all. But, if only during the busy holiday season, consider creating task-based stations in your pantry. 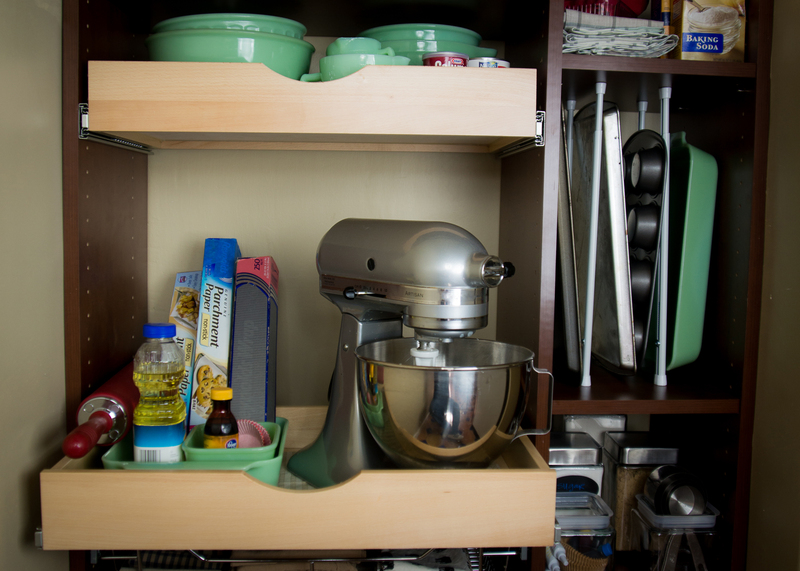 For example, if you tend to bake a lot more this time of year, your little kitchen closet can be a big help. Arranging all of your baking needs in one area not only makes things easier to find, but also allows you to quickly assess when you’re running out of something. And if you’ve ever stacked your baking sheets at the bottom of a cabinet, you know how annoying it can be to wrestle the one you need out from the middle. Storing baking sheets, racks and trays vertically allows you to choose the one you want effortlessly. This pantry is officially reporting for cookie duty. If you’re like me, you like to keep your bar well stocked during this season of entertaining and celebrating. 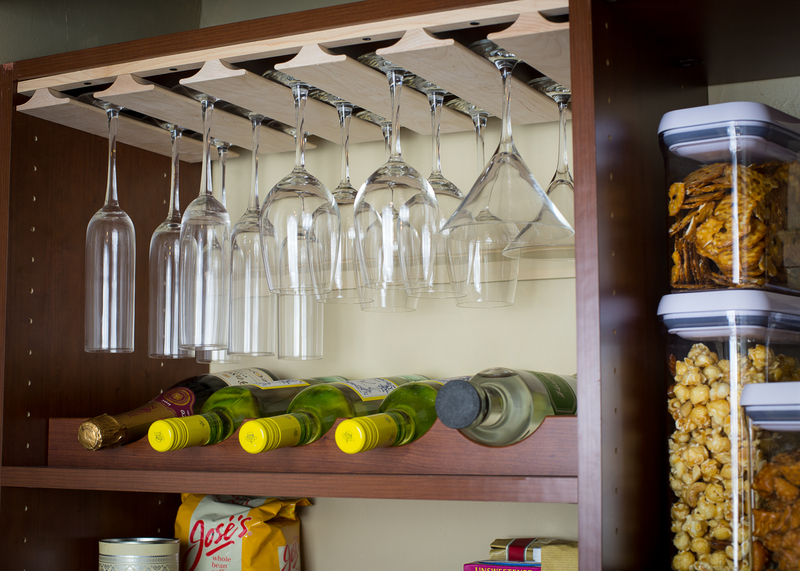 A dedicated rack for your overflow of wine bottles, spirits and champagne will keep things tidy and protected. This genius hanging glassware rack will keep your extra stemware safe, sound and accessible. Another benefit of having a designated cocktail station is that it’s very user friendly. If you’re greeting guests in another room, you’re now able to ask someone else to grab a bottle of champagne and some glasses from the pantry. They’ll find what their looking for in a snap – without having to rummage through your stuff. And the same is true when it’s clean up time, everyone can help you tidy up when there are delegated places for things. Cheers to that. A lot of us have some go-to meals we like to make often, and during the holiday season, some of these tried and tested meals have become traditions. Grouping together the ingredients and supplies needed for these feasts can be a big time saver. 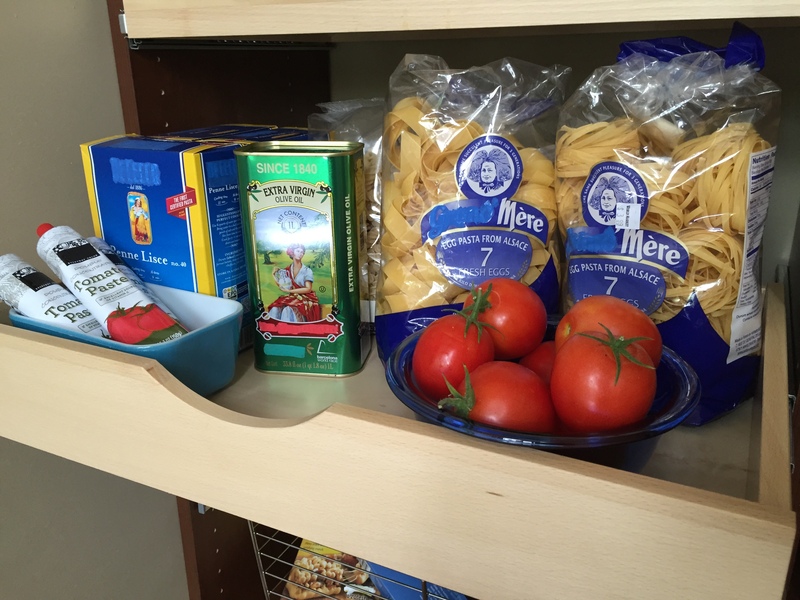 This Italian inspired pantry section allows you to pull out everything you need in one trip. So instead of digging through your rice and grains for your pasta, consider rearranging your pantry to support your favorite and frequent recipes. Now you don’t have to go on a full-fledged scavenger hunt before you start prepping your lasagna. Sounds molto bene to me! Now for the pièce de résistance: a pantry makeover! 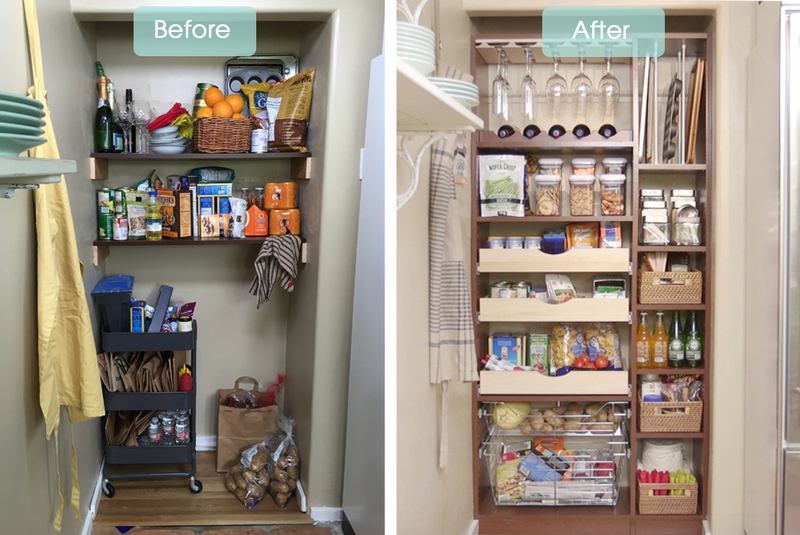 Laurie gave an unloved pantry some TLC with classic organizing elements like a stemware rack, pull-out baskets, beech drawers, and plenty of shelf space. This family needed a space to serve their love of wine, baking, and big Italian meals, and this makeover accomplished just that by using thoughtful design and using every inch of space.